(Newser) – Japan has unveiled its largest warship since World War II—and China sees the move as the naval equivalent of Japan thumping its chest. The $1.23 billion Izumo is a 19,500-ton vessel equipped with what Time calls "a conspicuously large flight deck" capable of carrying 14 helicopters; the country's two other helicopter carriers weigh in at 13,950 tons apiece and can hold 11 copters. An official tells the Wall Street Journal it will be used for peacekeeping, disaster, and anti-submarine operations. But China, which lays claim to the Senkaku Islands Japan controls, believes otherwise. Common, Japanese guys, we all know why you really built this ship! Its to fight Godzilla! Yes! He is alive and well and....on his way to Tokyo! Read the HEADLINE . " 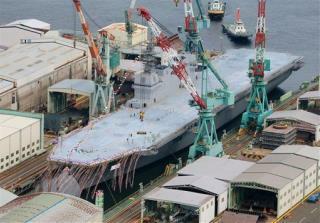 Japan Debuts Biggest Warship Since WWII Era ." This is a 'WARSHIP' ! . Not a 'CAR TRANSPORTER' . With a national debt equal to our total GDP. The other nations that have depended on U S support are realizing that the U S A is on its way from a world leader to a third world nation. (thanks to our militaristic capitalist 1% that wont spend on infrastructure so that they can have another house or yacht.) Soon it will be all nations fend for themselves....Countries like china and saudi arabia will not do well with trillions of dollars of our worthless debt that we can not pay back.. "The fortunes of wise men stand behind the gun" The main reason we are becoming a police state.